This is a remarkable picture. 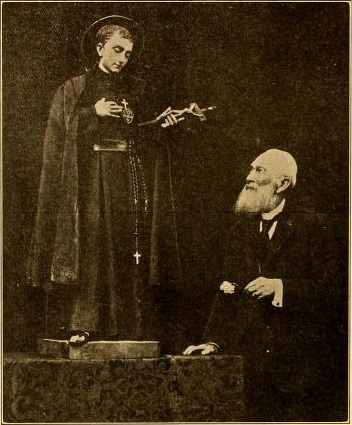 It shows Michael Possenti of Camerino Italy, aged eighty-seven years, placing at the foot of a statue of a saint a white rose. The statue is that of Saint Gabriel of the Sorrowful Virgin. The picture is remarkable, because he to whom the rose is offered and he who offers it – are brothers. Francis Possenti, now St. Gabriel of the Church Triumphant whose feast falls on February 27th, and Michael Possenti, of the Church Militant. The picture is remarkable because it represents a scene perhaps unique in the history of the Church. A brother still in the flesh pays veneration and homage to one of his own blood now glorified in heaven. Flesh is united with spirit, earth with heaven, mortality with immortality in a communion which only those who can appreciate who are blessed with the divine gift of faith. Michael Possenti, the sixth son of Sante Possenti and Agnes Friscioitti, is their ninth child. his brother Francis (St. Gabriel) was the eighth son and the eleventh child, three years younger than Michael. The latter is the only surviving member of a family of thirteen children. His was his singular privilege to be present at the beatification and canonisation of his young brother Francis. His venerable appearance and the youthfulness of Saint Gabriel, who died when but twenty-four years old are in striking contrast. It but typifies the difference between the two stages in which the brothers now exist – the Saint in the region of perpetual youth and eternal rest, the aged brother still in a land where everything changes and grows old. This picture also brings before us a vital truth. It visualises the holiness of the Church. In every age holy men and women have been born to Her, who is the Mother of Saints. Even in this so-called cultural and materialistic age, She still gives birth to those who practice in an heroic manner the Christian virtues, and whom She crowns with the aureole of sainthood.